So, it's perfect that Laura Mercier has just created one of the prettiest kinds - a long wear (hydrating) lip stain - with a glossy finish. 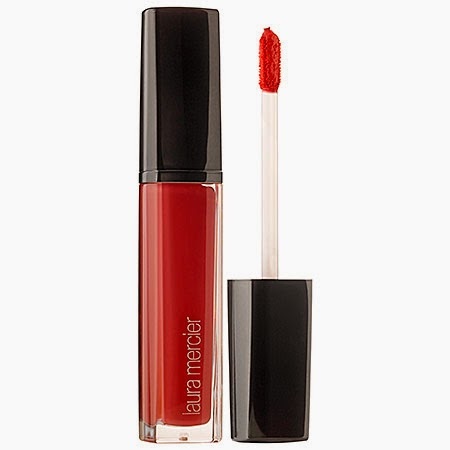 I wanted a nice red, and Laura Mercier Paint Wash Liquid Lip Colour Vermillion Red was perfect. The gloss is very lightweight yet still creamy - and highly concentrated. But 5-6 hours in, the rich red was still there as a stain on my lips. While the initial shine wore down, the finish still looked fresh and dewy (or a demi-matte), with no additional touch ups. The formula is also very hydrating and the color is buildable if you want just a touch of red for the day, for example, and a really "knock 'em dead" red lip at night. Another favorite shade of mine for a natural, every day look is Laura Mercier Paint Wash Liquid Lip Colour Rosewood (shown, above left). It's the perfect blend of a medium pink with a touch of brown. Go-->Laura Mercier Paint Wash Liquid Lip Colour Rosewood 0.2 oz.